When I moved here back in 1995 I was in my rose phase, and I brought many roses with me from my previous garden. Two of the roses were New Dawns, which I'd read were strong and healthy, with shiny green leaves. 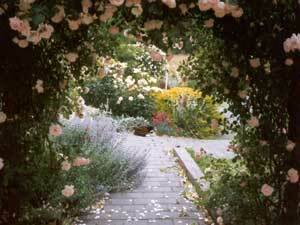 I planted them by the house, hoping they would form a rose arch. I didn't have any experience of climbing roses, and I had no idea how easily they would grow. 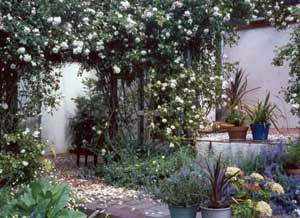 The patio pergola was bare and unadorned, and it seemed the perfect place for a rose experiment. I remembered all the beautiful pictures I'd seen in British garden books - I'd give it a try. 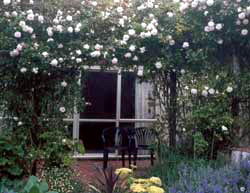 I planted the two New Dawn roses at the entrance to the house patio, and trained them into an arch up the pergola posts. For the first four Novembers the resulting look was amazing, as the rose covered the roof beams of the pergola forming a shady leafy ceiling. A carpet of pale pink rose petals was produced on the ground after every big wind. Sadly in November 1999 these roses were struck down by rust. Since I'm not a happy rose sprayer the damage was rather extreme, and went unnoticed at first. But then little spots of orange started falling on the table and seats below - not very romantic when sitting underneath a rose. New Dawn went bald by Christmas, and the subsequent new year clean up and pruning left an ugly archway of sticks midsummer. This wasn't a good look for the entrance to the house. In the rose year 2000 the rust struck again, though this time I thought I was better prepared - I had organised a spraying programme. But I did start to seriously wonder if any rose was worth this. There was no doubting the soft beauty of the flowers. They were a similar colour to the walls of the house, and blended well with the warm terracotta patio tiles. But eventually maintenance of their good health became too much of a problem, and sadly I chopped them down, replacing the roses with wisteria. Thus as one archway dies, so another is born, and in years to come the Wisteria Archway will have its story told.